Home » Blogs » maxine@bookculture.com's blog » Q&A with Brin-Jonathan Butler, author of "The Domino Diaries"
Q&A with Brin-Jonathan Butler, author of "The Domino Diaries"
On Monday, June 15, at 7pm, Brin-Jonathan Butler will be discussing his memoir The Domino Diaries: My Decade Boxing with Olympic Champions and Chasing Hemingway's Ghost in the Last Days of Castro's Cuba at Book Culture on 112th Street. Brin-Jonathan Butler is a writer and filmmaker. His work has appeared in ESPN Magazine, Vice, Deadspim, The Wall Street Journal, Salon and The New York Times. Butler's documentary, Split Decision, is an examination of Cuban-American relations and the economic and cultural paradoxes that have shaped them since Castro's revolution, through the lens of elite Cuban boxers forced to choose between remaining in Cuba or defecting to America. We would like to thank Brin-Jonathan for taking the time to answer our Q&A and for sharing his work with us! How did you come to write The Domino Diaries? I was told there was no where on earth where you would dream like you did in Havana. I was intoxicated with a city that promised infecting human beings on that level. I was burned out after dropping out of high school to finally sign up for some education with the rest of my life, beginning with writing two resolutely unpublishable novels, which I completed shortly before I landed in Havana at the age of 20. Both books were horribly difficult to write and I eagerly avoided bringing a journal, or a camera, or even any music to Havana when I arrived. I just wanted to be somewhere where I didn't feel like a fly on the wall of my own life. I was still young enough I had some aspirations with boxing that I was hoping to develop with pipe dreams of connecting with Cuba's Olympic boxing community. My luggage was comprised of a pair of gloves, wraps for my hands, a skipping rope, and all the books by Cuban writers, Cuban history, and biographies of famous Cuban figures I could carry in two carry-on bags. Even before I landed, it was demonstratively evident from the air that it required genius to take bad photographs of Havana. I think the same ingredients apply to writing about Cubans if you don't get in the way. All Cuban lives I encountered lived at the extremes of life and even those people limping through their day-to-day remained convinced they could dance. How can you tell any of those stories without offering something of value? 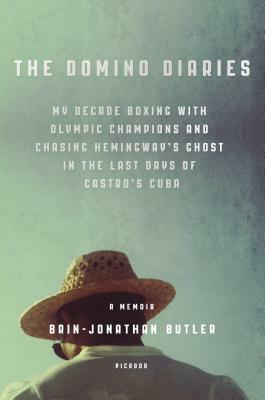 The Domino Diaries began in the margins of the books I brought over and in the letters I wrote home, mainly predicated on the unnerving feeling I felt more at home in a city like Havana than where I was born and grew up, thousands of miles and almost a different dimension away. My desk is full of scattered sheets of paper infested with notes along with what I'm currently reading: Nothing If Not Critical by the art critic Robert Hughes, The Kandy-Kolored Tangerine-Flake Streamline Baby by Tom Wolfe, a collection of essays by George Orwell, the letters of Hunter S. Thompson, and a collection of sports writing by Jimmy Cannon. Do you have a personal favorite book of all time? If so, can you share it and tell us why? My two favorites are J.D. Salinger's Nine Stories and Italo Calvino's Invisible Cities. Salinger's prose in many of the short stories are some of the finest and most haunting I've read in the English language. And they evolve so teasingly as you return to them over time with new experiences of your own. They just seem to be waiting for you with a wink. I adore Salinger's work, but Catcher is my least favorite as I return to them. Calvino's wisdom and playfulness in Invisible Cities speaks so marvelously to disprove Thomas Wolf's famous adage that you can never return home. Calvino, through Marco Polo recounting his travels to Kublai Khan, at one point is asked about the one city he's omitted: Venice. The city of his birth. He responds with the punchline that with each of the fifty or so cities he's inventoried he's never been talking about anywhere but his hometown. We can never return home? On the contrary, we can never truly leave home. Is there anything you are particularly looking forward to with the publication of The Domino Diaries? My mother told me before I stepped on the plane to Havana to look up friends of hers in Cuba. I asked why she'd never mentioned any before. "Because I haven't met them yet, Bwinny. But they're there." And, with a great deal of kindness, how right she was. I feel the same with readers. I've been fortunate enough to meet many writers I admired––usually via correspondence––and gain some measure of friendship. They were my friends on the page before I ever met them in person. At my lowest point writing the The Domino Diaries, hopelessly in debt, no writer was kinder or more of a Patron Saint of pulling off long odds than DBC Pierre was to me over the course of many letters. It would be a gift to offer something similar in spirit with a few readers. And, even better with a book, they can abandon me whenever they wish so there's little risk of wearing out my welcome. Or, if I'm lucky, they can return as often as they like to whatever paragraphs or pages gave them pleasure. I never wanted more out of life than to return that favor with stories. There's something quite civilized about that exchange and I'm grateful to have an opportunity to enter into that, admittedly with some sheepishness, with publication. What’s next? Any upcoming book projects in the works that you can tell us about?